Although the destruction of Normandy 1 occurs in the first five minutes of Mass Effect 2, Bioware rightly tried their best to keep the segment under wraps. For those who have played the first game, the reveal is powerful. In the scene, an enemy vessel carves into Commander Shepard's ship, ripping it apart. She ensures her crew's safety, walking through zero-g carnage to reach Joker, her ace pilot. More than establishing a fast-paced tonally dramatic introduction, Mass Effect 2 quickly establishes its intent to evoke nostalgia for the game's first iteration. By stressing the importance of the first game within the world and its characters, Bioware elicits sentimentality with an unprecedented success. Despite the multitudes of sequels, most games do not reminisce on the preceding title. On the contrary, sequels often seem to divorce themselves from, or at least ignore, their predecessors. Final Fantasy X-2 for example, the first real sequel in the Final Fantasy series, seems more disparate to FFX than it does to FFIX. The mechanics change dramatically between the two titles and, while the plot centers on pre-established characters, the two games are tonally inconsistent. 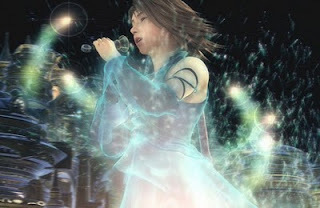 FFX-2 is a dancing musical number compared to the angst-driven drama of FFX. Similarly, while Assassin's Creed 2 includes some remnants of Altair's story arc, Desmond and Ezio exist independently, neither showing any sign of interest in Altair. While gameplay is similar, the environment is not. Alternatively, complete consistency between two games merely elongates one experience without evoking any sense of nostalgia. The Halo, God of War, and Gears of War franchises iterate slightly between each title, mostly maintaining one narrative arc and mechanical experience across multiple games. While a few twists remind the player of past narrative events, the games stand largely as one whole. Mass Effect 2 maneuvers between these two limitations, inconsistency and regularity, by demarcating the relationship between the two games with an obvious metaphor - the demolition and reconstruction of the Normandy. Appropriately, an optional side quest visit to the wreckage of Normandy 1 is included as free DLC content for those purchasing new copies of ME2. The entire sequence includes no combat, serving only to build sentimentality. Exploring the rubble for the dog tags of missing crew members, each with their own name, Shepard recalls still images from the first game. She also places a monument to those who lost their lives under her command. The moment is a silent and private affair, a narrative opportunity built solely to explore sentimentality. Commander's Shepard's interactions with old crew members and early dialogue options also develop nostalgia for past experiences. When first regaining consciousness, Shepard may inquire about the status of her past team members. When talking to Lt. Anderson and Joker, she may also probe further into the whereabouts of her old friends. While they have all moved on, no one reoccurring character is unaffected by their past. Garrus, Joker, Anderson and others express longing for the halcyon days working for the Alliance. Even Doctor Chakwas, a relatively insignificant NPC from the first Mass Effect, joins Shepard's crew. If selected, Shepard joins the doctor for a drink, reminiscing about bygone days and their shared memories. 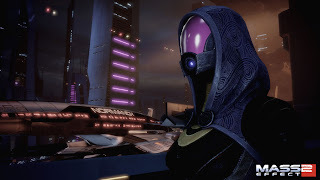 While many games have created nostalgia by referencing the games we grew up on, Mass Effect 2 evokes sentimentality by putting Commander Shepard through the same set of emotions. Her first mission is markedly strange without her loyal crew, and she expresses this same concern. Having to actively search out recruits dramatizes the absence of those who joined her in the first game out of a common sense of purpose. Dialogue options that express weary concern about her crew mirror my own hesitancy with a new cast of characters. 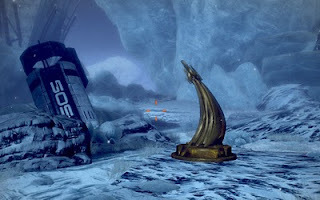 Players who delve into the game's sentimentality may also reward themselves with Shepard's collection of model ships from ME1, her own keep sake and memorial to the past. For those unable to import ME1 profiles into ME2, the experience could be very different. The mechanical and interface alterations may not evoke sentimentality from any player, but perhaps the scatted sci-fi references dotted around ME2 may serve to evoke nostalgia - in this case, for Firefly and Star Trek. Regardless, Shepard's consistent concern for past crew members, her numerous dialogue options that encourage reminiscence, and her encounters with old friends, should resonate with new and old players alike. Bioware succeeds in evoking sentimentality by doing what so many games have failed to do: making the first game clearly meaningful to the protagonist and her compatriots. It is a form of expert world-building few developers have even approached and Bioware should be lauded for it appropriately. I haven't played ME2 yet, but your post raises some good points about game sequels. For how iterative games are, how incrementally progressive, narratively games are almost always self-contained. Even a game like Uncharted 2, which returns to characters from the first game and is clearly calling back to those relationships, doesn't feel particularly attached to Uncharted 1 (I haven't even played Uncharted 1 and feel totally comfortable in Uncharted 2). To some degree I'm sure this is a marketing decision (you don't want to alienate new players), but more than that, perhaps game developers just haven't figured out how to effectively connect their games. It sounds like BioWare has done something good here, and I'm excited to experience it for myself. I think the marketing issue is spot on, which is interesting when you look at Bioware's marketing campaign. If they cared about alienating players, why did they so heavily display their every-man version of Shepard? I guess they marketed to new players, but most of the game is built to satisfy old players. I really want to know what new players think of Shepard and her/his relationships that carry over from the first game. I was unable to port my old ME profile into ME2, and it kind of took me away from the nostalgia, it even got me frustrated at some points, as I had to deal with consecuences of actions I didin't made, regardless, ME2 got me on good memories from ME, specially the Tali and Garrus missions. 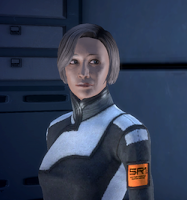 I noticed you talked of Shepard as a she, if i remember right your Shepard was a female with a deep scar on her face. Now that I think about it, there was a little meme between blogs where everyone would describe their own Shepard, it would be intresting to read about yours. The unfortunate side effect of playing ME1 but being unable to import your stats is a failure to evoke nostalgia. Bioware should have given players the ability to select outcomes, even if only a few important decisions. I may end up talking about my Shepard, but I think I'll wait 'till I'm down with ME2. There is still so much Shepard to explore! A wonderfully written article. I am an avid fan of ME2 and am actually starting up my own blog that I plan to be updating this blog on the Mass Effect universe. Feel free to check it out.